Welcome to the 6th edition of my weekly BullCharts software Tip Sheets, focussing on tips and hints relating to the use of the Australian BullCharts charting software package. The Australian financial reporting season kicks off next week, and runs for a few weeks. My expectation is that there will be some earnings surprises, and some shocks with forecast earnings for the next financial period. As per the infamous Dow Theory, the market discounts all news. That is, "a lot" of the pending good and bad news is already factored into share prices. But, I think there will still be some surprises. People can accept bad news, but we hate surprises. If there is a surprise that is not already factored in, then a stock could get punished. If we have too many of these, then it will be reflected in the index (either XJO and/or XAO, plus others). So, the index might suffer on the downside over the next few weeks. But then again, it might not. If this is going to happen, how can we use BullCharts to our advantage? Maybe on a daily basis (in the evening after the EOD data download) we could run a scan that looks for stocks with a high percentage change in share price (either a rise for considering a long trade, or a price drop for a possible short trade). Enough on the market. In this week's BullCharts Tip Sheet I am offering some thoughts on how to decide which stocks to search through when looking for investment opportunities. And relating this to BullCharts watchlists, and scans. Much of this information is covered in more detail in my subscriber-only Brainy's Monthly eNewsletter articles (on Technical Analysis, Share Trading and BullCharts). "Blue Chip" stocks - what does this mean? Investing Dilemma #1 - Which stocks to look through? What is liquidity? Why is it important? Which stocks have good liquidity? Investing Dilemma #1 - Which stocks to look through? Everyone faces this dilemma when they start out with investing or trading. Some people say that you should just search through the entire market for a stock to invest in. But there are advantages in severely limiting your long list of possible stocks, at least until you become more expert. Everyone who trades should be trading based on a documented and tested trading strategy. Your trading strategy might limit you to just Australian stocks - that's fine. But there are roughly 2000 stocks in the Australian stock market. And it can be a big job to wade through 2000 stocks to find buying opportunities. In your BullCharts software you might slowly build up a watchlist like the one in the accompanying screen shot. This shows the BullCharts Security Manager window pane with several "folders" under the "Watchlists" heading. And each folder might contain several different watchlists. In the sample here, there is one folder called "1. REAL_Watch", which contains a few watchlists, including one called "1. All Favs" ("Favs" is shorthand for favourites). Near the bottom of the screen shot you can see the text "757 Securities" which is the number of securities in the selected/highlighted watchlist. (Note: I use a numeral prefix on lists like this to force them to appear on the screen in a certain sequence - 0, 1 and 2 near the top of the list, and 7, 8, 9 towards the bottom.) It might take you a while to build up a watchlist of "favourite stocks" like this one. But then maybe this is not the smartest way to do this. If your trading strategy also says that you will only buy stocks with adequate liquidity, then this narrows down your selection of stocks significantly. This is a very sound position to take, because if you need to sell a stock quickly, you want to make sure there are plenty of buyers in the market. If you have a stock that only trades maybe 3 times per day on average, then you might have a lot of trouble selling at a time that suits you, and for a favourable price. Or if you have $20,000 worth of stock to sell, and the average daily turnover is only $40,000, then dumping half of the daily turnover amount could seriously affect the share price. But, what is this thing called "liquidity?..." What is liquidity? Why is it important? Trades - The number of trades within a specific period (eg. a day, or week). Here you might want to invest only in stocks that have had more than, say, 50 trades in a day (or 250 in a week). Value Traded (ie. the dollar value) - The value of shares traded in a period (money flow or dollar turnover). You might want to invest only in stocks with more than, say, $100,000 traded in a day, or perhaps $500,000 in a week. Volume - The number of shares that are traded in a specific period. You might want to make sure that your buy/sell parcel of shares is no more than, say, 5% of daily turnover. By trading only in liquid stocks, you should be able to exit the stock in a hurry for a reasonable price. BUT, which stocks have good liquidity? Normally all stocks in the S&P/ASX 50 index (for example). See the accompanying screen shot (click on it for a larger view) which lists the stocks and their number of trades in a week (in reverse order - lowest to highest, with only the first few shown). 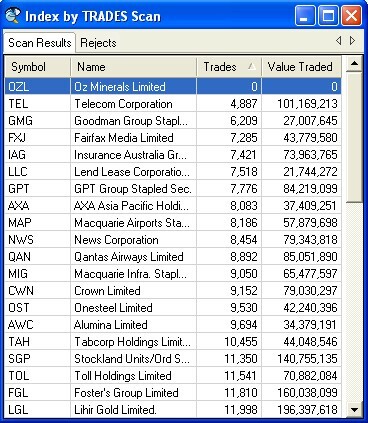 This is the scan results table from a BullCharts scan (see text below for details). You can see the number of trades in the last week for Telecom Corp was 4887 - a fair number of trades. Which stocks have good liquidity? The easiest way to find a bunch of stocks with good liquidity is to use one of the major S&P/ASX indices. It is really simple. Use a major index because "good liquidity" is one of the criteria for a stock to be included in the major indices (refer to the S&P and ASX web sites). Stocks with low liquidity will not be included in the key indices regardless of how big they are (for a simple discussion on how stocks are chosen to be in an index, refer to my Share Market Boot Camp seminar materials). Sample indices for you to look through include the S&P/ASX 20, 50, 100, 200. You can choose any one of these indices (and more) to run a BullCharts scan on. 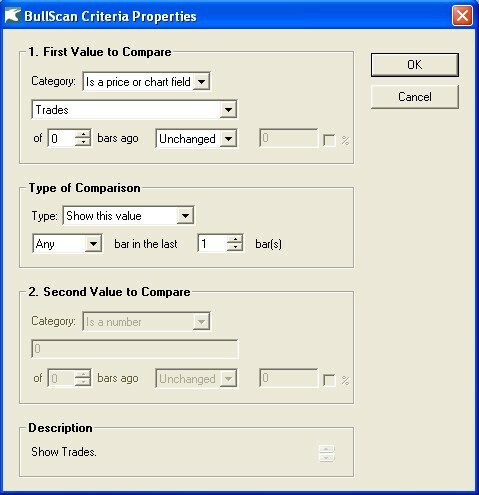 Start BullCharts Create a new scan Create a "New" criteria, and select "Category" = "Is a price or chart field"; and choose "Trades". for "Type of Comparison", select: "Show this value" (see the accompanying screen shot, and click for a larger image). Create another New Criteria to "Show" the "Value Traded". "Apply" the scan to save it, and "Run" this scan. In the resulting Scan Results table, you can click on a column header to sort the list by the values in that column. 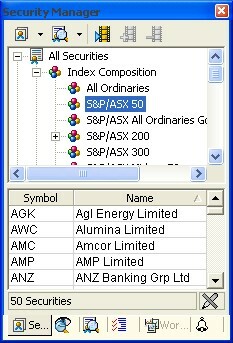 In your BullCharts Security Manager window pane (see the accompanying screen shot), the upper portion of the window includes a list of the stocks in each index, and in each sector. In a BullScan, you can easily select one of these indices as the "Securities to Scan". Or you can select multiple indices, or watchlists. I will soon be running a special hands-on BullScan workshop for you to learn more about the BullCharts scanning feature, and how to use it. Keep an eye out for details. More details on scans and how to create and customise them are included in Brainy's Monthly eNewsletters that are available to subscribers (for a very modest amount). Feel free to click on the relevant link at right to view samples and more details. These weekly Tip Sheets for BullCharts* users are intended to be short, quick grabs of information. They are not a replacement for the monthly detailed Brainy's eNewsletter articles, which cover these same topics but in much more detail. The eNewsletters article also cover Technical Analysis and Share Trading topics. Definition: Shares, usually highly valued, in a major company known for its ability to make profits in good times or in bad, and with reduced risk of default. In my Share Market Boot Camp Seminar I touch on this topic, and we spend a few minutes talking about what the term "Blue Chip" really means. If you search for a strict definition, you might have trouble finding a consensus definition. If you ask two different experts for a list of Australia's blue chip stocks, you will get two somewhat different lists. Are high in market capitalisation compared with the rest of the market. Share price tends to be in the medium to high bracket (ie. tends not to be low). Share price tends to be increasing over time, but is not guaranteed. These stocks are heavily reviewed and analysed by analysts and brokers, and there are often several market commentaries and recommendations for each of them. Many "advisors" will recommend to stick with these for various reasons; but this might not be the best advice. We know for sure that in the current economic climate, not even a blue chip company is guaranteed to have a robust share price. Therefore, if you invest in so-called "blue chip" stocks for the long term, then your portfolio value today might be down in the order of 20% to 40%. And, it might take about 3 years or more before your investment is back to the value it had at the end of 2007. What we are seeing now is that the "buy and hold" strategy is just not very good. We can try to convince ourselves that the stocks will come back. But we would only be kidding ourselves. But then, maybe it does not matter if your portfolio value is slashed. This depends on your real reason for buying the stock in the first place. Perhaps you bought for an income stream from dividends. Perhaps the share price value does not matter to you? But then, maybe it is important. CONCLUSION? Be careful when talking about blue chip stocks - as nothing is guaranteed. Don't limit your portfolio to just so-called blue chips. Also, continually monitor your portfolio for poor performers, and sell them if need be to be preserve your capital. This email was sent to robert.brain@y7mail.com by robert@robertbrain.com.